We sure love pasta around here! 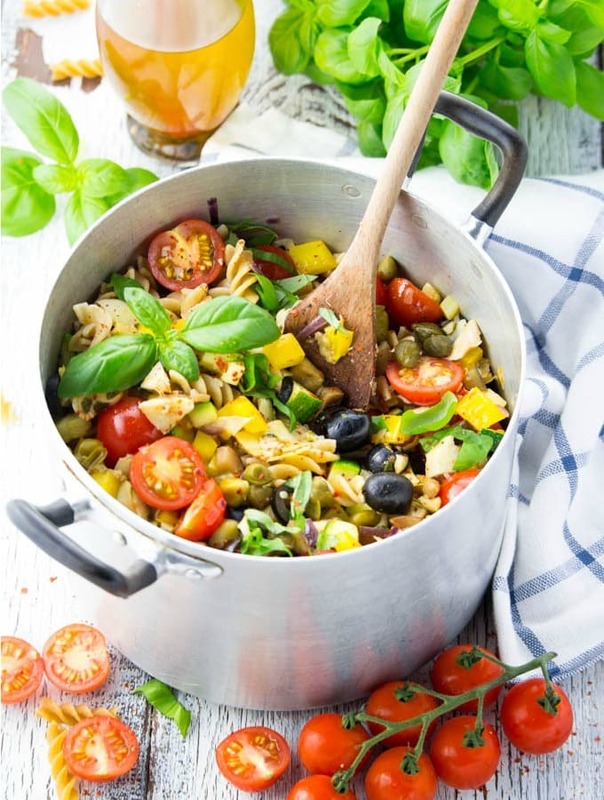 This Italian veggie pasta is my absolute favorite this summer! It’s super easy to make and it’s full of color and flavor. 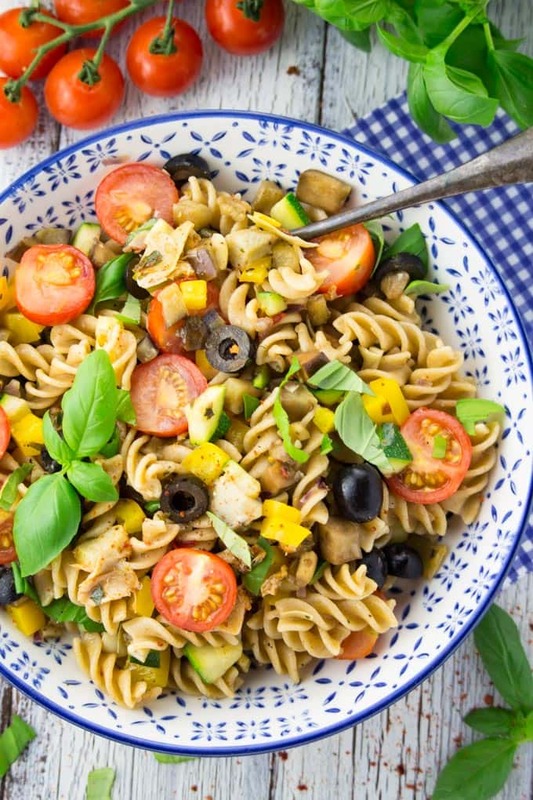 To make this veggie pasta, you need fusilli (I used whole wheat fusilli), a medium zucchini, half an eggplant, a yellow bell pepper, half a red onion, artichokes, capers, olives, cherry tomatoes, garlic, olive oil, and loooots of basil. The recipe really couldn’t be much easier. First, sauté the onion and the garlic and then add the zucchini, the yellow bell pepper, and eggplant. Roast it for a couple of minutes. Then just add the cooked pasta and the rest of the ingredients. Stir in the olive oil, season with salt and pepper, and sprinkle with fresh basil. That’s it! It’s important that you use a good olive oil with great flavor and aroma for this recipe. Make sure your oil is labeled “extra virgin”. The quality of the oil you use really does make a big difference when it comes to health benefits and taste. I love doubling the recipe because the leftovers make an awesome pasta salad for BBQs or picnics. Sometimes, I also add marinara sauce for a little change. 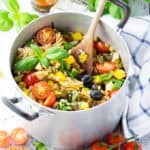 I hope you like this recipe for Italian veggie pasta as much as we do and it also makes you feel like taking a short trip to Italy. Hope you all have a great and sunny week! 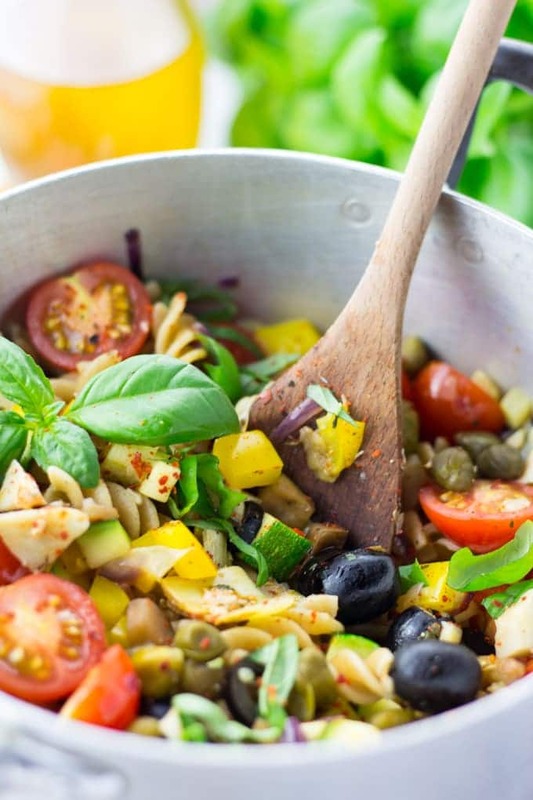 Close your eyes and this veggie pasta with olives, zucchini, eggplant, and capers lets you think you're on a vacation to Italy. Full of color and flavor! Cook the pasta according to the instructions on the package. Drain and set aside. In a large pan, heat some oil and sauté the red onion and the garlic for about 2 minutes. Then add the zucchini, the yellow bell pepper, and the eggplant and cook for another 3 minutes. Add the cooked pasta and the rest of the ingredients. Stir in the olive oil, season with salt and pepper, and sprinkle with fresh basil. 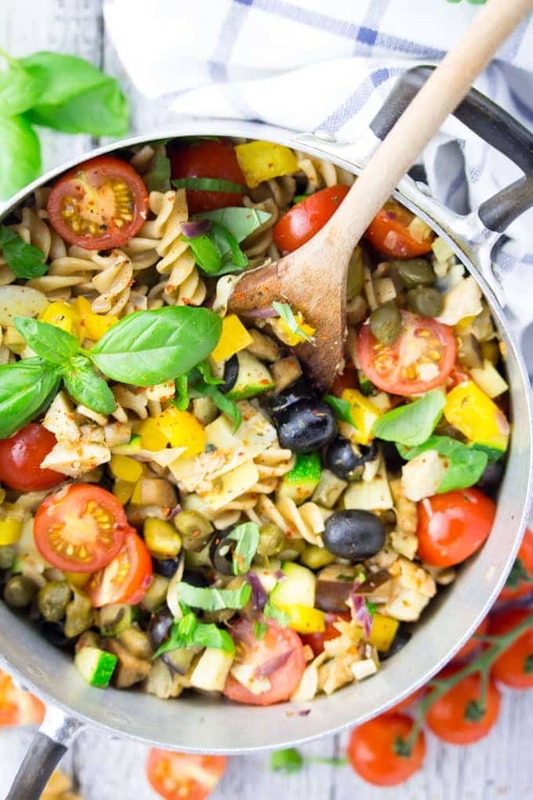 This is a perfect pot of veggie filled pasta! I’ve been loving pasta this summer! Not typical for me, but it can be such a beautiful dish! Love how veggie-packed this is! Pasta dishes can feel so heavy, and this one doesn’t at all. I love simple and fresh veggie pasta dishes. I made something similar with the ingredients from my garden a few nights ago. So good! Love the addition of capers and artichokes in your recipe. Sounds so fresh and delicious! I love veggie packed dishes like this…and when added to pasta, even the kids will eat it! So many things I love in one beautiful bowl! This sounds SO fresh and perfect for summer. I absolutely love pasta with loads of veggies!! This look so easy and so delicious! This is the ultimate summer dinner Sina! I could just see enjoying a bowl on the balcony with a glass of white wine – mmm! Your recipes are always so colourful and this Italian Veggie Pasta is no exception. It looks delicious! Some might call this a side at a BBQ, but it would be the main event for me! ? It looks SO good! 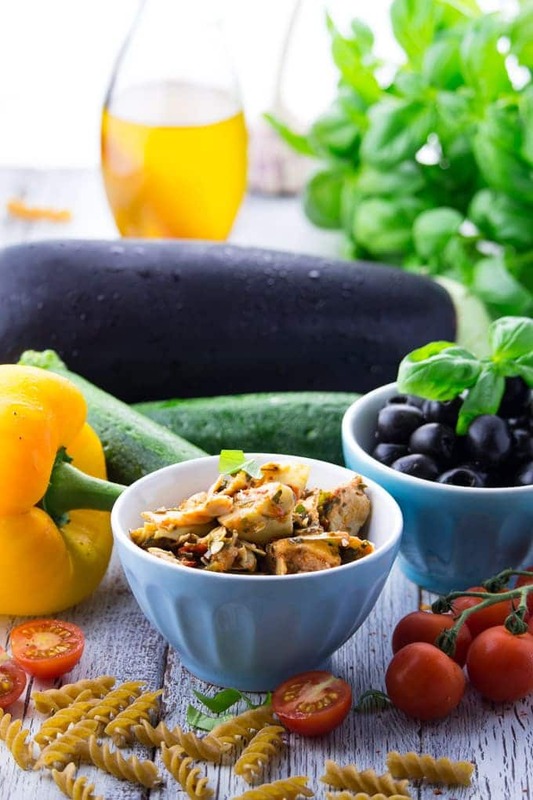 I’m loving the olives and the artichoke, and definitely the basil! I LOVE basil!